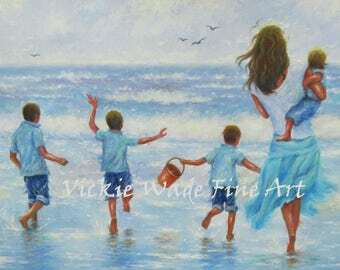 "Two Beach Boys Walking" is a large fine art print of an original oil painting of mine. The original is sold. The little brother has sandy blonde hair and the taller brother is a brunette. * Image size 11" X 14" approx. printed on 12" X 18" heavyweight smooth cover paper. * This print fits nicely in a standard ready-made 16" X 20" mat/glass/frame combo found at stores like Michael's Craft Stores, Hobby Lobby or other home decor shops. * Ships in a cello sleeve rolled in a sturdy shipping tube. 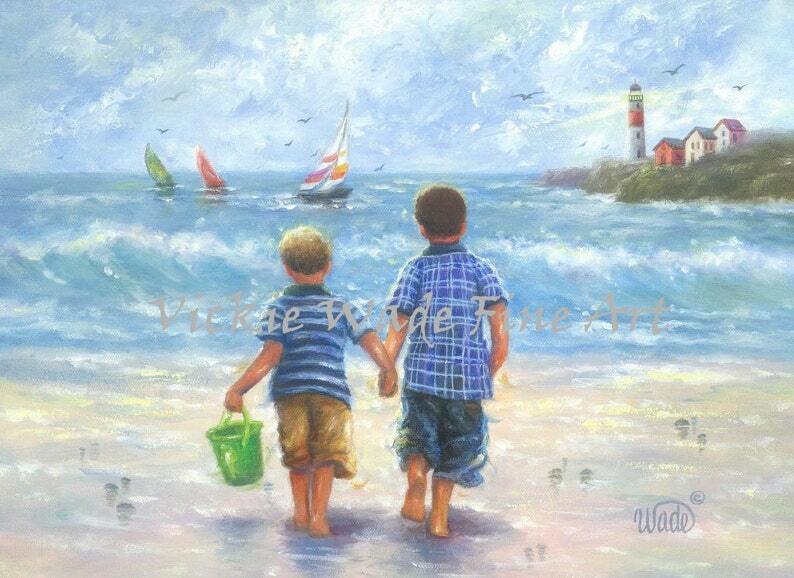 ****This print is available with two sandy haired brothers here: https://www.etsy.com/listing/155403497/two-beach-boys-art-print-two-brothers?ref=shop_home_active_1&ga_search_query=two%2Bbeach%2Bboys). Painting was just darling! Just as described, perhaps better than expected! Packaged appropriately and arrived super fast! Shop owner included a sweet hand written letter with an additional print for grandma! So sweet! 💙 Can not wait to hang it at our beach home!